Although Mercury passed inferior conjunction on December 28th it's not long before the fast moving planet re-appears in the pre-dawn sky. From southern latitudes it rises about 30 minutes before the Sun during the first few days of the New Year, although against the bright twilight sky it will be very difficult to spot. The visibility gradually improves until peaking when greatest western elongation (GWE) is reached on January 19th. On this morning from latitude 35S (approx. equal to Sydney, Cape Town and Santiago) the planet shines at mag. -0.2 and appears 11 degrees above the eastern horizon 45 minutes before sunrise. A further 10 degrees higher in the sky and slightly more to the east is fainter Saturn (mag. +0.6). Mercury remains visible for the remainder of the month but gradually sinks back towards the horizon. From northern temperate latitudes the apparition is not as favourable with the planet always hovering low down. For example from London, England (51.5 N) at GWE it appears only 5 degrees above the southeastern horizon, 45 minutes before sunrise. The thin waning crescent Moon passes 4 degrees north of Mercury on January 26th. Venus remains a stunning object that dominates the early evening western sky throughout the month. The brightest of all planets begins January in Aquarius at mag. -4.4. By months end it has moved into Pisces and increased in brightness to a near maximum of mag. -4.7. It still sets over 3 hours after the Sun from mid-latitude northern locations, although considerably less for those located further south. On January 2nd, the thin waxing crescent Moon passes 2 degrees north of Venus and does so again on the last day of the month but this time with a separation of 4 degrees. On January 12th, Venus reaches greatest elongation east when it's situated 47 degrees from the Sun. The following day the brilliant planet passes 0.4 degrees north of Neptune (mag. +8.0). The difference in brightness between the two objects is extreme with Venus over 100,000 times brighter than Neptune! Neptune is visible with binoculars although on this occasion a telescope is recommended for viewing due to searchlight glare of Venus. The apparent size of Venus increases from 22 to 30 arc seconds during the month with its illuminated phase reducing from 57 to 40%. Dichotomy or half phase occurs on January 14th. 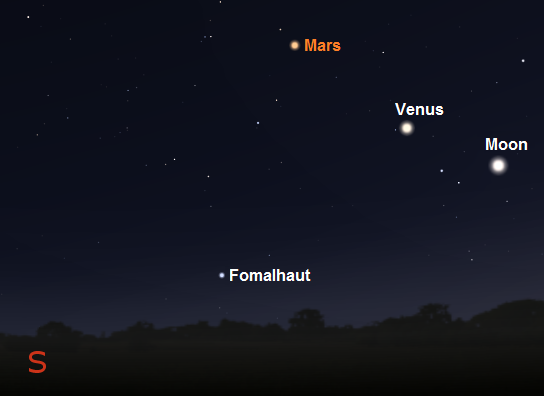 Mars like Venus is an early evening object this month. On New Years Day, the planet passes just one arc minute south of Neptune. This also happens to be the closest planetary-planetary conjunction of 2017. Mars at mag. +0.9 can be seen with the naked eye while eighth magnitude Neptune requires at least a pair of binoculars or a small telescope. On January 3rd, the thin waxing crescent Moon passes 0.2 degrees north of Mars with an occultation visible from Southeast Asia. Mars reduces slightly in brightness during the month from mag. +0.9 to +1.1 with its disk shrinking from 5.7 to 5.1 arc seconds. Such a small apparent size makes it very difficult telescopically even at high magnifications to spot any surface features. 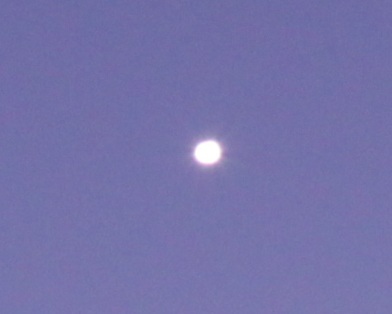 Venus is now rapidly closing in on the "Red planet" and by months end it will be less than 6 degrees to the west. Venus is 100 times brighter than Mars. Jupiter the dominant planet in the Solar System is now a brilliant morning object moving direct in Virgo. The giant planet rises after midnight at the start of the month, improving to before midnight by months end. It remains visible until dawn. As the month progresses, Jupiter increases from mag. -1.9 to -2.1 with its apparent size improving from 36 to 39 arc seconds. Positioned four degrees north of Jupiter is Spica, the brightest star in Virgo. However, although Spica shines at mag. +1.0 and is the 16th brightest star in the night sky it's easily outshone by brilliant Jupiter; the giant planet appearing 16 times brighter. Through a pair of binoculars the four large Galilean moons, Io, Europa, Ganymede and Callisto are readily visible. They change position as they orbit the planet and sometimes all four can be seen at once but often one or more are obscured from view as they pass in front of or behind the Jovian disk. Occasionally none of the four can be seen, just the planet itself. When viewed through a telescope, Jupiter is a stunning sight. Even a small 80mm (3.1 inch) refractor will show the main Northern and Southern equatorial cloud belts. Larger telescopes reveal subtle details. With time and patience features such as small belts, ovals, festoons, dark regions and of course the famous "Great Red Spot" can all be seen. 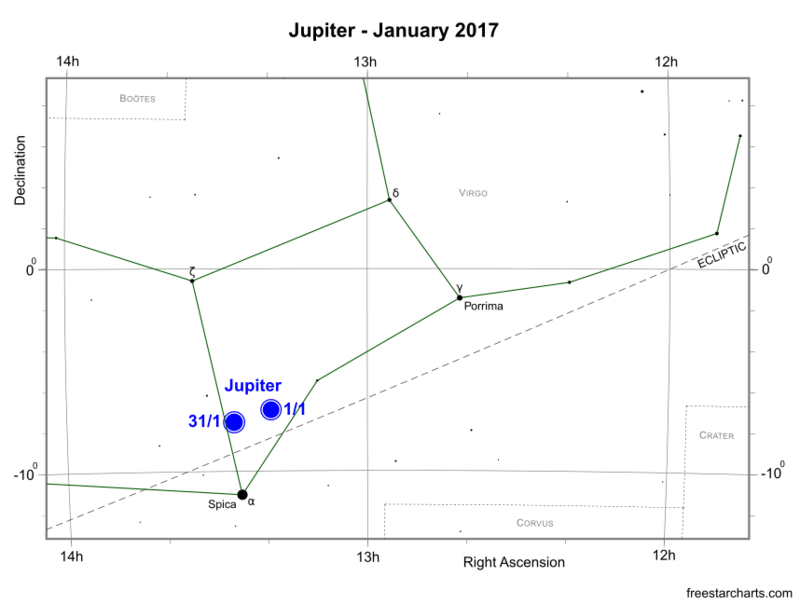 On January 19th, the waning gibbous Moon passes 3 degrees north of Jupiter. Saturn, mag. +0.6, is now an early morning object in Ophiuchus. With a declination of -22 degrees the beautiful ringed planet is better seen from southern and tropical latitudes where it rises 90 minutes before the Sun at start of the month. As January progresses its visibility continues to improve and by months end it rises nearly four hours before the Sun, although about an hour less from northern temperate locations. Through a telescope Saturn's most famous feature is of course its spectacular ring system and even a small telescope will show them. They are currently displayed wide open at a tilt of 26.7 degrees, which is about as good as it gets. In addition, small scopes will also show the brightest Moons including Titan, Rhea, Tethys and Dione. The angular diameter of Saturn increases slightly this month from 15.1 to 15.5 arc seconds with the ring system spanning 35 arc seconds. On January 24th, the waning crescent Moon passes 4 degrees north of Saturn. Uranus, mag. +5.8, is moving direct in Pisces and remains visible during the first part of the night although it sets before midnight by months end. The seventh planet from the Sun is positioned about 15 degrees south and 20 degrees east of the centre of the Great Square of Pegasus and a degree southeast of zeta Psc (ζ Psc - mag. +5.2). Uranus is faintly visible to the naked eye but dark skies are required. For most observers this is not the case and therefore at least a pair of binoculars or a small telescope is necessary. Any quality scope at medium to high magnifications will show the disk of Uranus, which appears pale green in colour and spans 3.5 arc seconds. Its small apparent size means spotting surface details is difficult even with the largest of amateur scopes. 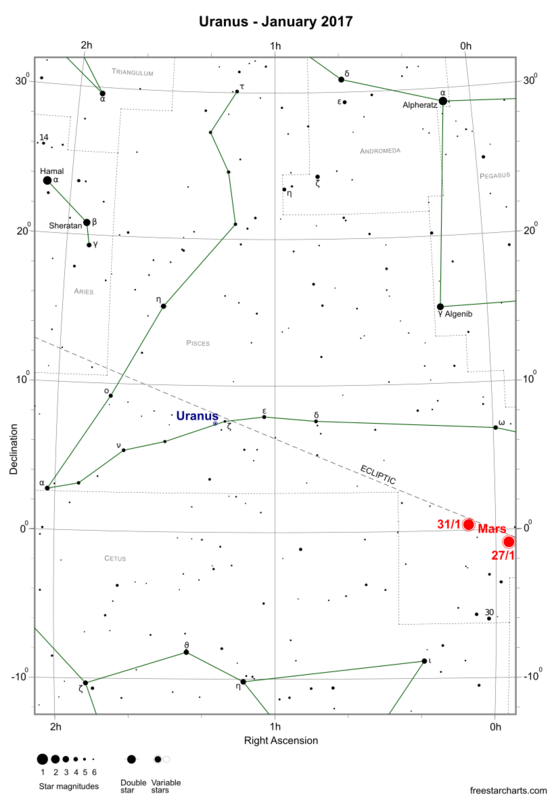 On January 6th, the waxing gibbous Moon passes 3 degrees south of Uranus. Neptune, mag. +8.0, is an early evening object in Aquarius that's visible above the western horizon for a short time as soon as it's dark enough. As the month progresses the planet will become increasingly difficult to spot as the twilight sky draws ever closer. Neptune is the only planet that can't be seen with the naked eye but it's quite easy with binoculars and small scopes once the correct region of sky has been located. January also offers the last realistic opportunity to catch a glimpse of the most distant planet in the Solar System before it reaches solar conjunction in early March. 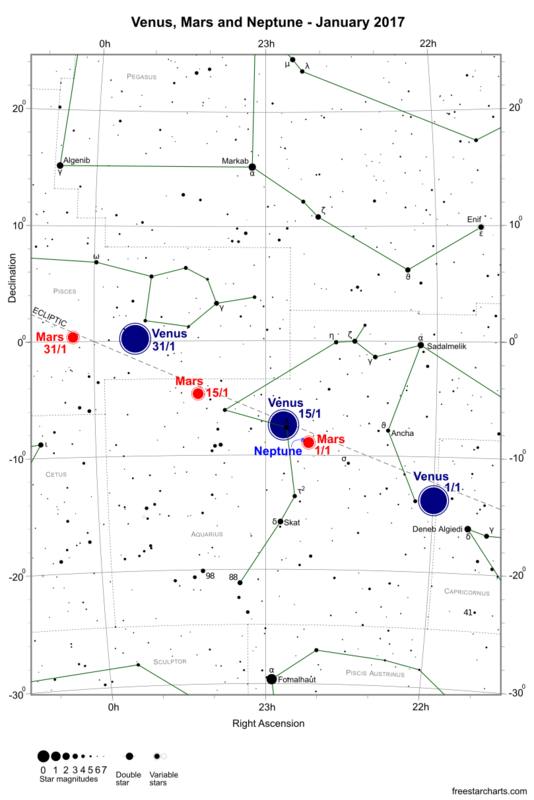 Neptune is positioned about 30 degrees southwest of the centre of the Great Square of Pegasus and 3 degrees southwest of star lambda Aqr (λ Aqr - mag. +3.7). Positioned 20 degrees further south of the planet is first magnitude star Fomalhaut (α Psc - mag. +1.2). It's a busy month for Neptune regarding conjunctions. 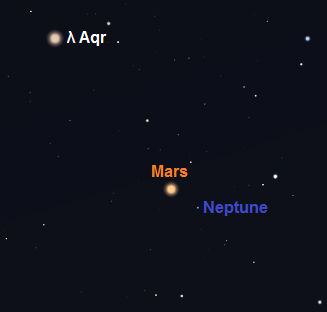 As mentioned above on New Years Day, Mars passes just 1 arc minute south of Neptune and later on the 13th, Venus passes 0.4 degrees north of Neptune. In between on the 3rd, the waxing crescent Moon passes 0.4 degrees north of Neptune with an occultation visible from western USA, Hawaii, Pacific Ocean, southeast Asia at 4:13 UT.